Everyone is ready for Passover, right? Because, like, it starts tomorrow. 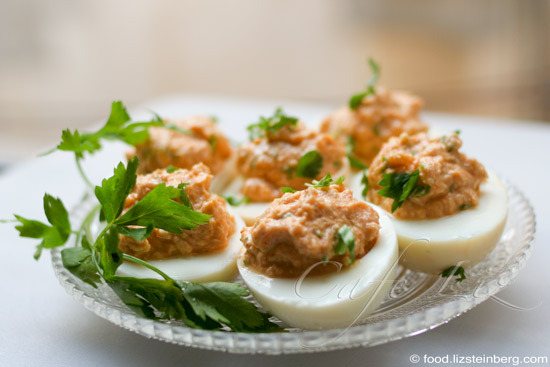 Well, just in case you’re looking for a little something to upgrade your seder table, you can check out these deviled eggs with horseradish filling – an attractive little dish that combines a few of the Passover symbols into one appealing concoction. Or even better, once the seder is over, you can take your leftover eggs and homemade horseradish and upgrade them. 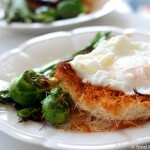 And that’s why I’m bringing you this recipe only a day before the seder. That’s my story and I’m sticking to it. 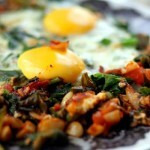 Or better yet, you can make hard-boiled eggs specifically to make this recipe! Do you know how many eggs I bought last week? Four dozen. That’s right, and we’re only 3 people in this household. A full 18 will be going into our family’s favorite Passover food, bimuelos. Ah, Passover, the holiday of eggs. Here’s wishing you a good one. A good holiday, that is. Well, maybe a good egg, too. Slice the eggs in half, the long way. Remove yolks into a bowl. Set the egg whites aside for now. Mix yolks, mayonnaise, horseradish, salt, paprika and parsley. 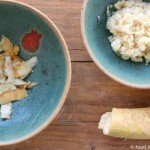 Adjust the horseradish to control the degree of spiciness – my horseradish tends to be pretty strong. Fill the egg whites with the creamy horseradish filling. You can use an icing bag for effect, or you can just spoon it into place. Top with an extra sprinkle of chopped parsley to serve. 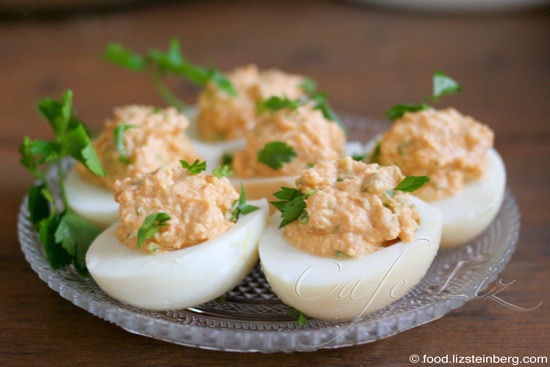 One Response to "Deviled eggs with horseradish filling"
The filled eggs look great. Never tried to combine eggs with horseradish. It would be a perfect easter dish as well. Thank you!! Happy holidays.